back row: Nick Wright, Erin McCumiskey, Ash Erickson, Alex Williams. front: Jessica Saadi, Nicole Brooke, Sam Young’s and Brodie Parish. With something like 300 employees, several venues and two more venues on the horizon, Momento Hospitality has a lot to offer job seekers. 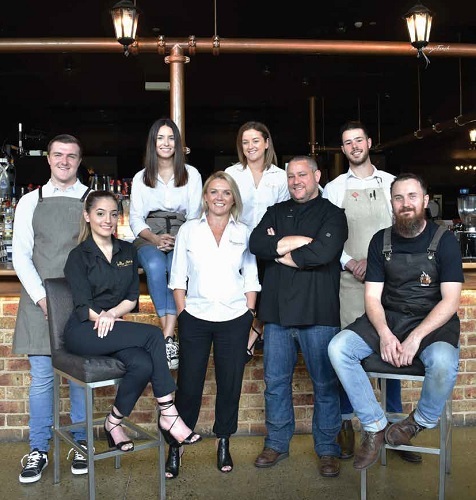 Brodie Parish started working with the company 16 years ago at the Castle Hill Tavern and is now now General Manager at the Hillside Hotel after numerous positions in the company including trainee manager, licensee and group gaming manager. “Over the years I have completed dozens of short courses on both Hard Hospitality Skills and on leadership. I have had the opportunity to attend company funded self and professional development conferences interstate and abroad and I have worked with some brilliant operators, who were always willing to impart their wisdom and life’s lessons onto me. Momento Hospitality has been part of life in the Hills for the past 25 years when the Colosimo family opened the Castle Hill Tavern. Momento owns the Bella Vista Hotel, Hillside Hotel, The Governor Hotel, Momento Conference and Events Centre and it’s mobile street truck Fire & Brimstone. Two new venues are due to open soon.